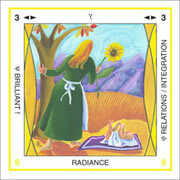 The image on the right is that of a Rainring card – Radiance – as it appears in the hard copy of the cards available to purchase. The format offered on the web almost corresponds to the first stage in the development of the cards. At that point, each card had one mention, though the coloured number also existed. The word at south remains the principal mention. It is this which gives its name to the card. Note, however, that in the set 6 cards the image faces not south, but west. Despair, for instance, is the mention shown online, but the name of the card which features the image of despair is actually ‘Sensation’. The east side has two mentions, the first, characteristic of the set (3 here), the second, representing the group (6 here). The card thus has four sides, each with a related meaning.